Starting today, “The Surrounding Game” (2017) is now available worldwide on digital streaming, DVD and Blu-ray. 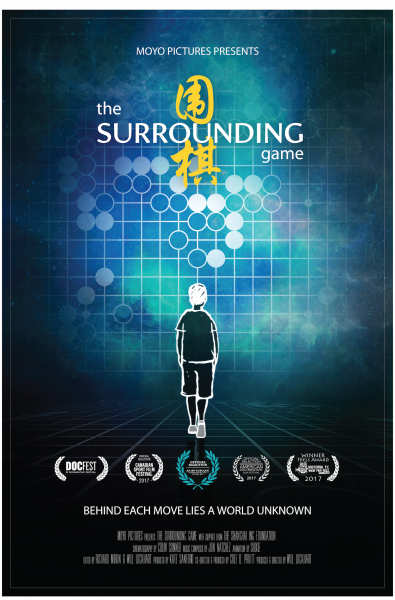 The award-winning documentary tells the story of go, from the four arts of ancient China to modern-day international competition, to the growth of the game in the West. “I am so proud of everyone who worked on this project and brought their energy, their creativity, and their passion to it” says director Will Lockhart, “and we are all so excited to be able to finally offer the film for home use!” Click here for a short interview with Lockhart by AGA Broadcast Coordinator Michael Wanek. In addition to the main feature, the filmmakers are releasing six never-before-seen deleted scenes and interviews. “This is some of our favorite material that didn’t quite make the final cut, and we think you’re gonna like it!” says Lockhart. The extras are included on the new DVD and Blu-ray discs, and are also available separately on digital download and streaming. Available for streaming and download here, and on DVD and Blu-ray here.